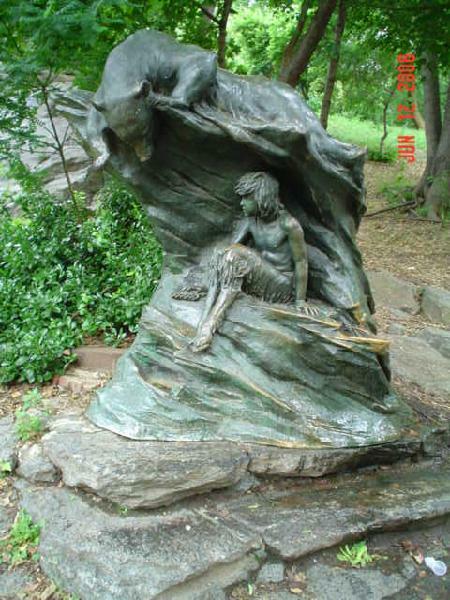 Daytonian in Manhattan: The 1914 Alfred L. Seligman Fountain -- "The Bear and Faun"
The 1914 Alfred L. Seligman Fountain -- "The Bear and Faun"
Banker and musician Alfred Lincoln Seligman was highly respected as Vice President of the National Highways Protective Society. Seligman had also been deeply interested in the children of New York and devoted much of his time to providing musical instruction for them. In 1911 The New York Times reported on his plans to donate a fountain to the City of New York for the enjoyment of children. California-born artist Edward Edgar Walter would design a sculptural, child-pleasing fountain. The plans were abruptly halted when, in a cruelly ironic twist, Seligman was killed on June 24, 1912 in one of the first documented automobile accidents. The National Highways Protective Society took up the cause, donating additional funds to the $2000 project. Cast at the Roman Bronze Works, Walter’s finished 7-foot sculpture was both functional and incredibly charming. A young faun rests in a grotto, his pan pipes at his side, while an inquisitive bear peeks over the rim at him. It included a drinking fountain for humans and a basin for thirsty dogs. Frederick R. Coudert, President of the Society, presented the gift to the Parks Commissioner, Cabot Ward. “Alfred Lincoln Seligman sought not for fame, but in his comparatively short life he devoted much of his time to the young people of the city…It is because of his attitude toward the children and his work for their safety, health and happiness that this monument to his memory is peculiarly appropriate,” he said. After sixty years in its picturesque setting at the foot of a staircase in the park, the fountain was restored in 1997 by the City Parks Foundation Monuments Conservation Program with financial aid from the Florence Gould Foundation. The naturalistic Alfred Lincoln Seligman Fountain, also known familiarly as the Bear and Faun, is one of the most enchanting outdoor sculptures in the city.